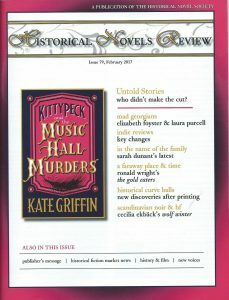 I am, amongst other things, the UK Children’s/YA book Review Editor for the Historical Novel Society Review. This means that I can keep in touch with what’s going on in the children’s historical novel world. Children, after all, are the adult readers of the future. The February issue of the HNS Review has just come out and I’ve been sending reviews off to various publishers and asking them for suitable new books for the May HNS Review. I’ve also emailed those publishers who have not had books reviewed to see if they have anything suitable for the HNS May Review. As usual, there is quite a variety on offer; excitement, tragedy, thought-provoking, laughter, love and friendship, it’s all there. And, of course, the history. 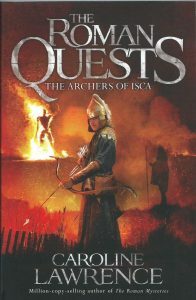 I’m thrilled to get the new Caroline Lawrence: The Roman Quests: The Archers of Isca. She is the author of the popular Roman Mysteries, and this new series looks like being equally exciting. In 2009, Caroline won the Classical Association Prize for ‘a significant contribution to the public understanding of Classics’, and you know you won’t find any anachronistic tomatoes or potatoes in her novels! Her historical research can be trusted. 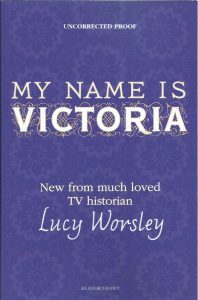 Next up, and by complete contrast, is My Name is Victoria by Lucy Worsley, well-known for her lively history television programmes. This is a riveting story of Princess Victoria’s miserable childhood seen from the viewpoint of Victoria Conroy, daughter of that sinister éminence grise, Sir John Conroy. It ends with a splendidly unexpected twist. 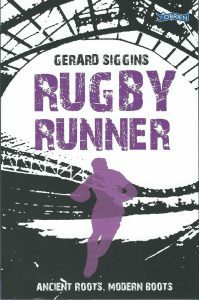 Rugby Runner by Gerard Siggins is obviously a book for boys. Eoin is captain of the Rugby Junior Cup team at school, and hoping to be chosen for the first-ever Under 16 World Cup Ireland team. But he also has another gift: he can see ghosts. And this ghost is on a mission which goes back to the very origins of the game. Can Eoin help him? I haven’t yet read Rugby Runner, but Siggins’ last book had an interesting real-life spectre: Prince Alexander Obolensky, who fled the Russian Revolution in 1916, played rugby for England, and met his untimely death when a trainee RAF pilot in 1940. I’m all for mixing rugby and history – why not? – and Siggins knows how to grab the reader’s interest. May 1536, London. This dark Tudor tale has an unusual hero. Young Kit, son of a London baker, lost his family to the plague and was nearly buried alive in a plague pit. 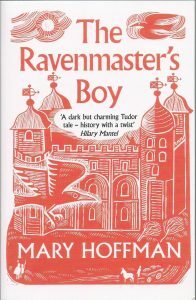 Rescued by the Ravenmaster at the Tower of London, and brought up as his son, Kit discovers that he can understand the language of ravens. Queen Anne Boleyn has just been arrested and her future looks uncertain. Nobody knows what will happen, and the threat of treason hangs over everyone, even Kit. If Kit cannot help Queen Anne directly, there might be something else he could do for her, even if it’s dangerous. 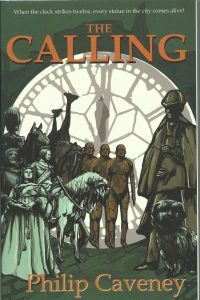 The Calling by Philip Caveney, is a historical novel with a difference. The setting is Edinburgh on the one night of the year when all the statues come to life. The Boy, who is suffering from amnesia, doesn’t know who he is or what’s going on. Then he meets the statues, now down from their plinths. He recognizes David Livingstone and Sir Walter Scott, but others are strangers to him. And what about that dog? But this is not a party: there is a mystery which must be solved before the night is out. I always like Philip Caveney’s books. You are guaranteed an enjoyable read, and you’ll be much better acquainted with Scottish history by the time you’ve finished the book! This is Book 2 of TIMEBOMB, and, as Sci-Fi Now says of the first book, it is: A fast-paced time-hopping thriller. Time-wise, it jumps between Beirut in 2010, to Mars in 2155 ‘and beyond’. 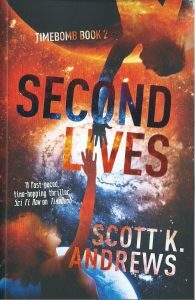 Second Lives sounds thrilling but it is not an historical novel. The most extraordinary, so-called ‘historical novels’ drop onto my doormat; often they are Fantasy, with, perhaps, a knight and a dragon on the cover. A book about knights in armour may be historical, but dragons definitely aren’t. Nor are gladiator zebras. And I’ve had both. If I can’t review a book, I give it to Tony Brown from my local library. He is happy to take it off my hands, together with any other review copies I don’t want to keep. These are just some of the books for the HNS May Review and, doubtless, a few more will drop through my letter box. I have already sent my reviewers books and there are more to come. I am awaiting books set in India, Java and Berlin, which will widen the scope. The deadline is the end of March, when the reviews must go to go to the overall editor in the States. After that, there is a pause until the May HNS Review is out when the whole process starts again. What I find very cheering is that the historical novel genre is obviously alive and well. The future is looking good. I’m pretty sure my love of history can be directly traced to the historical stories I read as a child. Rosemary Sutcliffe, Geoffrey Trease. Georgette Heyer, of course, as well as Jane Austen. Long may they thrive. I agree, Jan. I also read my father’s G. A. Henty (1832-1902) adventures. They were full of deeds of derring-do, though the female characters didn’t get much of a look in. Having said that, he told a rattling good story. Some of his novels have wonderfully Victorian titles; I particularly like ‘By Sheer Pluck’! I am a little embarrassed to admit that all my earliest knowledge of French history came from reading Dumas – not just the musketeers in the C17 but also the C16 events surrounding the last Valois kings, the St Bartholomew’s Eve massacre and Henri IV. I later moved on to the real history, but what a stirring introduction to historical events Dumas’ lively and exciting novels gave me. I’ll add to Jan’s favourites Margaret Irwin with her novels about Elizabeth I and “Minette”, Charles I’s youngest daughter. Ah, yes, Dumas! I quite agree with you, Pauline, his novels are tremendously exciting. I read them when I was seventeen and living in Paris. I have Dumas to thank for improving, not only my understanding of French history, but also my French! No embarrassment is necessary, in my view! Oh yes, history was a first love for me as a child too. Heyer of course, which I started age 11. Then I loved Margaret Irwin too, Jean Plaidy, Anya Seton and others. I learned so much history from them. Mary Renault for the ancient Greeks. Lots of Tudor stuff and early medieval. The one era I never got a great deal of through novels was the Civil War and the Stuarts. I was an avid historical and sci-fi reader in my youth – wouldn’t touch contemporary fiction until I was well into my 20s and started to be interested in the world around me. Fabulous job you have with the HNS, I must say. Thank you for your interesting comments, Elizabeth. It’s interesting how the same names come up again and again: Heyer, Irwin, Anya Seton. I got my fix of Stuart history thanks to Margaret Irwin’s ‘The Stranger Prince’ (Rupert of the Rhine), not to mention Captain Marryat’s ‘Children of the New Forest’, and Angus MacVicar’s ‘The Grey Pilot’ about the escape of Bonnie Prince Charlie after Culloden. My job with the HNS allows me to see what’s hot in the children’s historical fiction world. The Tudors, thanks to Hilary Mantell, are very popular at the moment. And I’m in touch with several Irish publishers who have a number of excellent Irish novelists looking at that country’s history.